Frankly, kitchen domestics make me go “blaaaah”. I’m chicken about chopping. What if I accidentally slice off the tops of my fingers together with the carrots? Cooking a simple meal for the kids can take an entire afternoon, because I’ll be carefully cutting each and every slice into the same exact proportions and arranging every ingredient into a television show-style line-up before any actual cooking begins. The entire process is tiring and stressful. I’d rather live on bread and butter than bother. But when the kids saw a picture of this “Goat Xi Fa Cai” food art bento (see top middle picture) by 3M™ Scotch®, they squealed in delight and said they’d help. So we tried it out. I’m glad to say that with Scotch™ Titanium Kitchen Scissors and the Scotch™ Portable Food Scissors, food prep was a breeze and that no fingers were harmed in the making of this bento. The Scotch™ Titanium Kitchen Scissors has blades which are four times stronger than stainless steel, allowing it to stay sharper longer. The micro-serration blades add an extra level of sharpness so it’s strong enough to cut through meat and bones! The Scotch™ Portable Food Scissors (which my kids used) have stainless steel blades that are polished to resist corrosion. Though they’re incredibly sharp as well, the scissors comes with a safety lock feature and a cover so young ones won’t accidentally injure themselves with it. It’s also easy to bring out and about to conveniently “slice and dice” food into safer sizes for babies and toddlers. The kids did the cutting, the placing, and the cut-outs flowers. I only had to shape the sheep and cook the chicken and the vegetables. The kids passed with flying colours; I failed miserably. So as you can see below, we have no sheep. I could not get the rice to stick together. I thought about using super glue, but we had run out of it (just kidding!). We’ll attempt it again another day. 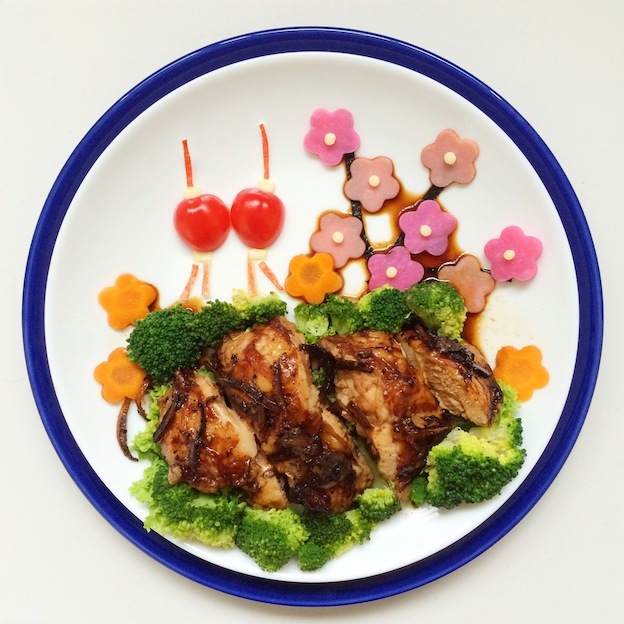 In the meantime, here’s the recipe for the seriously adorable “Goat Xi Fa Cai” Food Art Bento. Do give it a try and let me know how you get your sheep to stay in shape please! The good people at 3M™ are also giving three SingaporeMotherhood readers a set of Scotch™ Titanium Kitchen Scissors ($22.90 with GST) and Scotch™ Portable Food Scissors ($13.90 with GST) each — in time to help with Lunar New Year feasting preparations! Just leave a comment at the end of the article to tell us what kind of food art bento you’d make with these. We’ll get in touch with you by Wednesday 18 February 2015 to let you know if you’re one of the winners! 1. Using the Scotch™ Portable Food Scissors, cut the cherry tomato into half. Put the cut surface down on a clean white plate. 2. Tear off the red part of the crabmeat stick, cut into thin strips. 3. Cut two little square cubes out from the cheese slice for one lantern. 4. To assemble, place the cheese cube at the top and bottom of the cherry tomato. Arrange the crabmeat strips at the top and bottom of the cheese cube. 1. Using the Scotch™ Portable Food Scissors, cut the seaweed into curvy strips to resemble tree branches. 2. 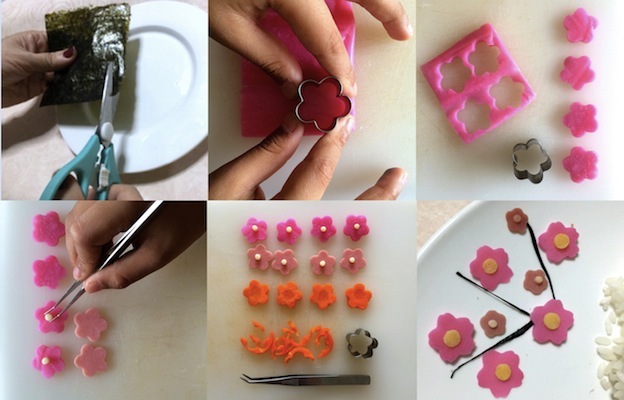 With the flower pattern cookie cutter, cut out 4 pieces of the flower pattern using the pink part of the Japanese fish cake, and cut out 4 pieces of the flower pattern from the chicken ham. 3. Take the slice of cheese, mould out the round center core of the flower using a drinking straw. 4. Using the tweezers, place the round shaped cut-out cheese at the centre of the plum blossoms. 5. Arrange the tree branches on the plate and place the cherry blossoms at the sides of the branches. 1. To get the beige sushi rice, mix 1 tsp of teriyaki sauce and 1 tsp of tomato sauce to the plain sushi rice and mix well. 2. Using the Scotch™ Portable Food Scissors, cut the features (eyes, nose and mouth) of the goat from the seaweed. Keep them aside. 3. Using the small Yakult straw, cut 3 small round shapes to make the cheek blushes of the goat. 4. 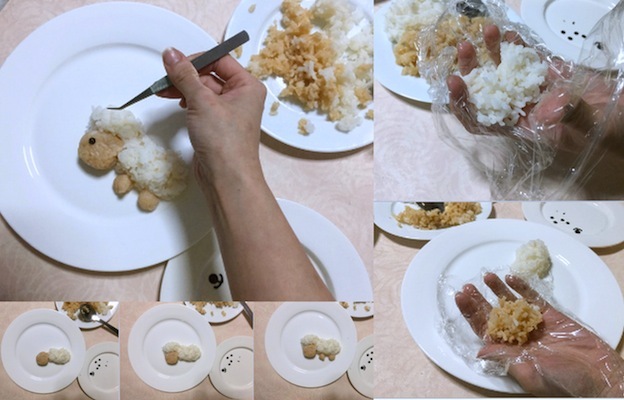 Using the heat-resistant cling wrap, shape and make 2 small rice balls using the beige sushi rice. Each should be about 1 cm large. Make another 4 tiny rice balls for the legs. 5. Make another 2 rice balls using the white sushi rice for the head and two bigger ones for the body. Do not hold the rice ball too tightly when prepping, so that the sheep looks more fluffy. 6. Place the facial parts of goat on the beige rice balls. 7. Assemble the goat by attaching the head and body, and placing the beige rice ball with facial expression underneath. Place the tiny round beige rice balls under the body as legs. 1. Place the chicken thigh in a zip lock bag with all the marinade ingredients above. 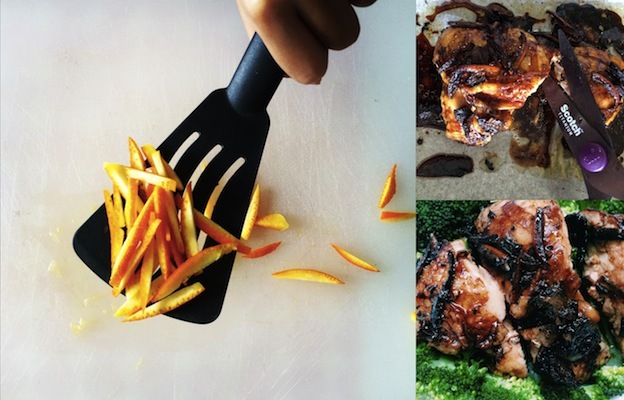 Place it in the fridge for 30 minutes. Heat oil in a medium sauce pan, sauté the garlic and tangerine peel till fragrant for about 2 minutes. In a small bowl, combine the orange juice, water, sugar, soy sauce, dark soy sauce and rose wine. 2. Pour the sauce mixture in the saucepan and add in the peppercorn. Bring to boil and reduce the sauce till it has thickened. Turn off the heat. 3. In a preheated oven, place the marinated chicken thigh on an oven tray and pour the sauce over. Bake under 200°C for 20 minutess. Halfway through the baking time, spoon some sauce over the chicken to further caramelise the chicken skin. 4. Let the chicken rest for 10 minutes before cutting it into 2 cm thick slices using the Scotch™ Titanium Kitchen Scissors. 5. Place it over a piece of Chinese lettuce on the food art plate. 1. 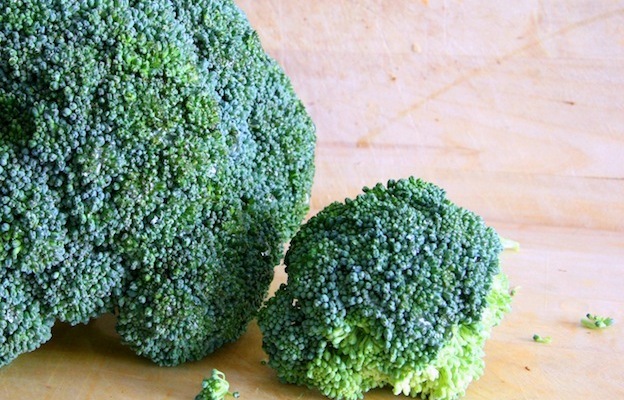 Cut the broccoli into florets using the Scotch™ Titanium Kitchen Scissors. Slice the carrots thinly and mould them into flower patterns using the cookie cutter. 2. Blanch the broccoli and carrot in boiling water until tender crisp. Remove, rinse with cold water, drain and set aside. 3. Heat wok with cooking oil, add in minced garlic and cook till fragrant. 4. Add in sliced carrots and stir fry for a minute. 5. Add in broccoli flower and do a quick stir. Add in pepper, light soya sauce, sesame oil and abalone sauce. Toss well and reduce the sauce. Turn off the heat and leave it to cool slightly before cutting it with the Scotch™ Titanium Kitchen Scissors. 6. To arrange on the bento plate, use the Scotch™ Titanium Kitchen Scissors to trim the top part of the broccoli florets and arrange them at the sides of the plate. Use a pair tweezers to pick up the carrots and arrange them on top of the broccoli. 7. Place some wasabi pea spouts at the sides to decorate. Would you like to get crafty with your bentos and enjoy easier food prep? 3M™ is giving three (03) SingaporeMotherhood readers a set of Scotch™ Titanium Kitchen Scissors ($22.90 with GST) and Scotch™ Portable Food Scissors ($13.90 with GST) each. Leave a comment below (by noon on Wednesday 18 February 2015) to tell us what kind of food art bento you’d make and you could win a set of these elegant kitchen cutting tools. Note: Winners will have to leave a review of their scissors at these websites: Detachable Titanium Kitchen Scissors & the Anti-Bacterial Portable Scissors. Would like to make the Chinese New Year Plum Blossoms food art bento by my kid. They look simple enough for a first time food art bento maker. I will make panda food art with them as we just saw the pandas at River Safari recently. Will create scenes of Jurassic Park or vehicles with them as they love cars, Dino’s, trains etc. I’d make playful story-themed bento lunch boxes, like Little Red Riding Hood, Three Little Pig, etc, to get my kids to eat right. I Would like to make a mickey Mouse bento for my kid since he is a fan of mickey. 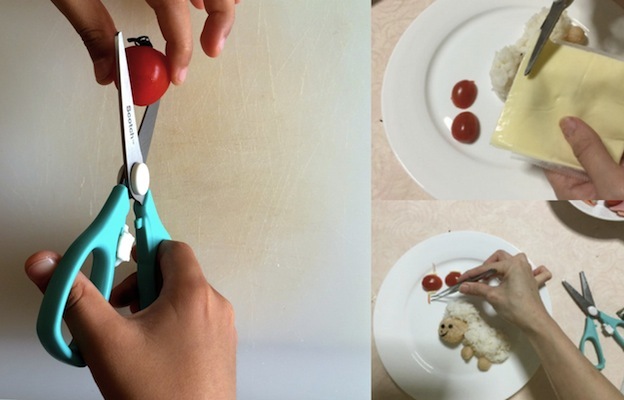 I’ll creates adorable character bento for my children. My boys love Spiderman, Spongebob and Super Mario. I would make a transportation themed bento for my kids because they like cars. 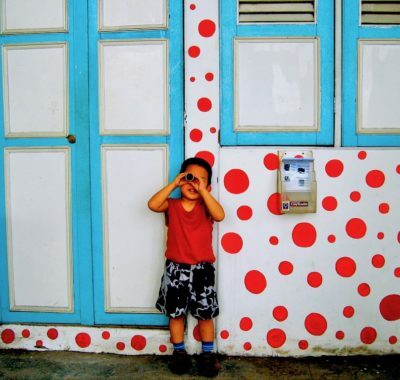 my kid loves flowers, butterflies, trees …. so hopefully i can create a garden bento …. I will make a train bento art as my little ones are in the ‘bus craze’ now. We will create an aeroplane bento art together as he loves to ride in aeroplanes. We will make an aeroplane bento art because my kid loves taking the aeroplane. will make a cars and lorries theme bento as the kids love anything with wheels. Hi, where can I buy the scotch portable food scissors? I can’t find it. Hi Jean, the Scotch Scissors are available at the following Supermarts: FairPrice Supermarket, FairPrice Xtra Hypermarket, FairPrice Finest Supermarket, Sheng Siong Supermarket, Home-Fix DIY Stores, Cold Storage, Giant, Popular, Selffix DIY, OG Albert Court, OG Orchard, OG People’s Park, Isetan, Meidi-Ya. For more specific locations, kindly visit: http://stickwithscotchbrand.com.sg/scissors/products/where_to_buy The Scotch™ Titanium Kitchen Scissors retails at $22.90 (w/GST) and the Scotch™ Portable Food Scissors at $13.90 (w/GST).